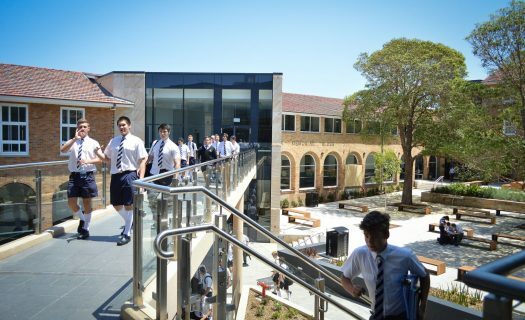 In the IB and HSC program there are opportunities for boys to study external language programs or a range of courses at TAFE as part of the TVET offerings. In the HSC program there are opportunities for boys to study external language programs (via NSW School of Languages (SOL) or the Saturday School of Community Languages) or a range of courses at TAFE as part of the TVET offerings. In the HSC program there are opportunities for boys to study external language programs (via The NSW School of Languages or the Saturday School of Community Languages) or a range of courses at TAFE as part of the TVET offerings. In the IB Diploma students are able to study courses on site at MLC or ST Andrews Cathedral School, online via Pamoja Education, or with specialist tutors in some cases. Subjects completed outside Newington will frequently have additional costs. Students who seek to complete an alternative language program with an approved external tutor will be required to negotiate and meet the costs of instruction by the tutor. Students considering taking an online course through Pamoja are encouraged to find out more about style of learning and requirements through the Pamoja website. For Year 11 students in 2019 (and those progressing onto Year 12 in 2020), the College’s annual tuition fee will cover up to $1000 of the net cost to the College for TVET, SOL and SSCL courses when that course is taken as part of a student’s normal curriculum. The specific costs will not be known until the end of 2017. However, estimates based on 2018 enrolments can be given to you by Mr Roberts (VET Coordinator) Ms Marnie Foster (Head of Languages). Additional costs associated with these programs need to be met by individual students. Admission to these courses is selective. Boys wishing to attempt a any of these courses will be interviewed by senior staff and must be supported by their Head of House in their application. Past academic effort and behaviour will be considered in the selection process, students must be able to demonstrate a sound work ethic and the skills to learn independently to be permitted to follow alternative patterns of study. The school reserves the right to reject an application by any boy wishing to enter these programs. The programs are designed for boys capable of independent, self-motivated, disciplined study and, in the case of TVET, this takes place in an adult environment. There will be a strict cut-off date for applications. Late applications from boys simply wishing to drop subjects they don’t like will not be accepted. Boys must want to complete the external subject from the outset. All participation in external courses will be reviewed at the end of the each semester. Admission to external courses is not automatic. The external agencies may not be able to offer courses originally chosen by boys. Quotas also apply. Boys should have another subject in mind in case their external course is not offered or is full. In the event that a boy is removed from a course by the external agency or Newington for attendance, academic or behavioural reasons, the full cost of the course must be met by the parents. Similarly, in the case of a boy voluntarily withdrawing from an external course prior to the final IB or HSC examinations all tuition fees for the course must be met by parents. Boys must remember that course completion is entirely dependent on attendance and consistent diligence. If course requirements are not met, then boys may put their HSC or IB completion in jeopardy.